If you suffer from chronic low back pain or neck pain and have been told to just live with your pain, or that surgery is your only option, we have the solution -- Decompression Therapy! KDT Decompression Therapy is a safe and effective treatment alternative to surgery and has helped thousands of patients who have exhausted all treatment options for chronic back pain and neck pain conditions. Many of our patients had tried everything to relieve the causes of back pain or neck pain including addictive pain killers, epidurals, spinal fusion, back or neck surgery, or they have been told to just live with the pain. What is KDT Decompression Therapy? KDT Decompression applies an "axial" or distractive force to the injured disc levels. During treatment, intradiscal pressure is dropped from a positive to a negative. This negative pressure promotes diffusion - the intake, of water, oxygen, and nutrients - into the disc, thereby rehydrating the degenerated disc. 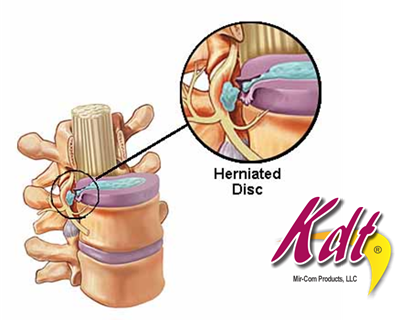 KDT Decompression Therapy reduces pressure inside of the disc. This reduces the painful herniation and the pain from other disc related degenerative conditions. The pressure reduction results in increased blood flow to the injured area, reduction of pain, increased mobility and tissue repair. KDT Decompression Therapy is drug-free, pain-free and is a successful alternative to neck or back surgery.